The unprocessed pledge is probably (and quite by accident, I think) the perfect way to begin thinking about food and sustainability, and how they relate. Whatever the reason you came to this challenge, and I am sure that for many of you it was about healthier eating and/or better cuisine, if you have taken and followed the challenge you are most of the way to having a very sustainable kitchen. All food uses energy in its growth, production, processing, transportation, preparation, and storage. The energy can come from different sources: Organic farming primarily uses solar energy to grow the food, whereas conventional farming adds fossil fuel energy in the form of synthetic fertilizer. On a large farm, both methods of farming will likely use a diesel tractor to harvest. 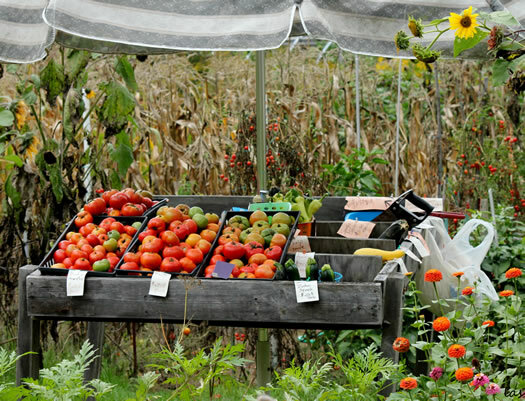 On a small-scale, local farm, the vegetables are more likely to be harvested by hand. Some foods, however, use much more energy, and typically these same foods use much more water. The biggest culprit: Conventional beef and dairy. Livestock in general is more energy- and water-intensive, because on top of the water that cows drink and any energy associated with their keeping, we must add the water and energy used to grow the food that they were fed while maturing. Cutting back on meat, even if that just means cooking vegetarian a few times a week, is the quickest, simplest thing that you can do to reduce your diet-related carbon footprint. If that is too extreme, replacing beef with chicken regularly is also very effective. The more processed your food is, the more energy is used in that step — though sometimes it reduces energy elsewhere: Canned food need not be refrigerated, for example. Purchasing fresh vegetables, therefore, may be more or less energy efficient, since they may have to be refrigerated in transport and at your home. Then there is the processing you do in your kitchen. For a quick overview, see this post from my blog about the most energy efficient cooking methods. Understanding energy inputs, however, is just the tip of the iceberg. Pollution, monoculture, human health, resource depletion — these are all issues that affect the sustainability of our food production. In the Atlantic Ocean, for example, many fish populations have become so stressed that marine biologists don’t think they can recover (check out the Monterey Bay Aquarium for more on seafood). The corn belt has been water mining for decades to provide the country (and its cattle) with tons of high-yield corn for cheap calories, and eventually the available ground water will run out. Concentrated feed lots concentrate manure, and sometimes pollute otherwise potable groundwater and contaminate crops intended for human consumption (remember the E. Coli in our spinach? That came from infested cows kept too close to land used for agriculture). The solution to all of these problems is first and foremost understanding the problems. That is why October: Unprocessed is such a wonderful idea, and why I was so excited to be involved. It requires participants to take a long, hard look at where their food comes from and how it got to their tables. More to the point, it requires that you remove from your diet anything which, after a reasonable effort, you cannot understand. This simple rubric tends to line up pretty brilliantly with sustainable best practices. The best tool available to forge sustainable food habits is your local Farmers’ Market. How better can you understand the food that you eat than to have a conversation with the farmer who grew it? Farmers’ Markets also naturally promote a culture of healthful, wholesome, whole foods, sustainably grown and harvested. Finally, the farmers at the market tend to be at the vanguard when it comes to preserving heirloom varieties and fighting monoculture. If you do not know about Farmer’s Markets in your area, check out Local Harvest, a database of CSAs, FMs, and other purveyors of local whole foods. Even if you can’t afford to buy all of your groceries from the farmer’s market [See yesterday’s guest post], getting a few items each week and talking with the other patrons and vendors will provide you with an education that cannot be replicated anywhere else. The benefits of buying fresh, locally grown, organic vegetables are manifold. They are more nutritious, more flavorful, keep longer, tend to be more sustainable, and bring you closer to your community. Ultimately, a diet consisting mostly of whole, fresh foods, in which meat is viewed as a luxury rather than a necessity, is much more healthy and sustainable. Taking the Unprocessed challenge, in other words, is likely to bring you closer to sustainable best practices whether you were thinking about it or not. Photo by las – initially. Thanks for bringing attention to this topic; I agree that cutting back on all meats would be beneficial, even though I am an unapologetic omnivore. However, I think you were remiss not to mention grass-fed, pastured beef (and other pastured livestock) as an alternative to conventional. Yes, so far it is still slightly more expensive, but there are bulk-buying choices directly from ranchers that reduce costs to almost that of feedlot beef. Well-managed grazing can actually benefit natural habitats, enabling really great stewardship of the land and numerous health benefits to us humans. And if you are buying from a source close to home, that steak is likely to be more environmentally friendly in many, many ways than the banana in your lunch bag. I couldn’t agree with you more. If you read my blog, you would see that I am huge advocate of grass fed and pastured meat. The latest post on my blog touches on this exact point, in fact. I also wrote about a local company that is producing sustainable beef. For this guest post, I felt that if I only got one message out to people who were maybe unfamiliar with the issue, eating a little less meat was much more important than engaging in the very complex discussion of what meat is sustainable and what is not. It is an incredibly complex issue, the more I look into it the more overwhelmed I am sometimes. But thank you for the thoughtful comment, it is important to point out that some pastured livestock can be a very important part of a sustainable farm. You are totally right; for me, it seems a full-time job to research and understand the complexity of the issue, so I guess it’s my night job since I’m already employed 😉 I look forward to reading your blog!